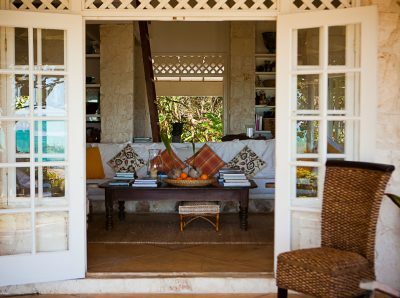 In celebration of Earth Day April 22nd, this blog will showcase ways t o decorate with organic materials. Earth Day began in 1970 to recognize the need for preserving our natural resources. Organic is defined as anything made from natural or living materials. Nature has long been the inspir ation for home design. Man has decorated with natural and earth-inspired resources since the beginning of time. Wood and stone are popular design elements in many design styles including Rustic, Craftsman, Art Nouveau, and Contemporary. Art Nouveau, an international style of art and design popular from 1890 to just prior to World War I, was inspired by natural form and structures particularly flowers and plants. Van Dyke’s Restorers offers a number of Art Nouveau inspired products including patterns of decorative glass, nature-themed knobs and pulls, wood molding, corbels, and lamps. Many of the Tiffany style art glass lamp shades have botanical and nature motifs. 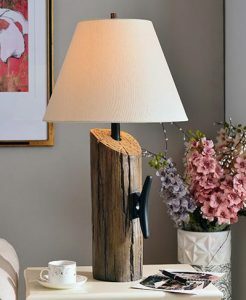 The Kenroy Home Cole Table Lamp has log-like base for an organic, nature-inspired look. Eco-friendly is a popular buzz word today and many homeowners and interior designers are using eco-friendly products in home design and furnishings. Natural materials are not only eco-friendly, they are believed to bring a soothing and calming presence to the space by bringing a feeling of nature indoors. 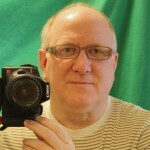 Natural products include wood, stone, copper, and glass. As one of the country’s leading suppliers of wood products, Van Dyke’s has literally thousands of wood items including corbels, island legs, furniture legs, furniture feet, molding, capitals and pilasters, rustic brackets, rafter tails, outlookers, appliques, cabinet knobs, tambours, ceiling medallions, mirror frames, mantels, floor registers, and furniture kits. Copper is another organic product that is popular in today’s home. 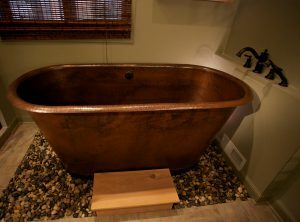 From copper sinks to bathtubs, copper is both beautiful and eco-friendly. Copper is not only recyclable, but has natural anti-bacterial and anti-mold properties. Van Dyke’s offers hundreds of copper items including dozens of styles of sinks, faucets, copper sheets, cabinet knobs, mirrors, switch plates, bathroom accessories, lamp bases, water pitchers, trays, range hoods, and door hardware. Nothing says organic quite like natural stone. 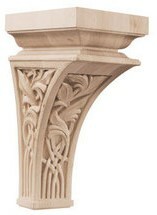 Van Dyke’s has a number of stone items from cabinet pulls with natural stone inlays to decorative lamp bases. Stone is both earthy and durable. 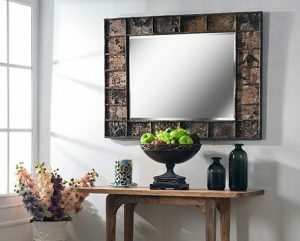 In addition to stone, Van Dyke’s also has products made of slate including lamp bases and decorative mirror frames. Wood veneers are thin layers of wood used to cover furniture, counters, and cabinets. Choose from dozens of styles and wood types. Continue the natural design theme by incorporating earth tone fabrics in curtains and pillows along with wood accents, flowers, and plants. Add some exotic touches like bamboo and jute. Van Dyke’s has lamps with jute shades.